From time to time the United States Army issued a document that prescribed an official uniform to be worn by soldiers of the Army. Such a document was issued as General Orders Number Six of 13 March 1861. These Regulations describe what would be the standard Union Army uniform, worn both by the few Regular Army troops and most of the large number of state volunteers who were mustered into federal service. The uniform as actually worn differed somewhat from what appeared in print. For example, trousers were to have been of dark blue cloth for enlisted men (paragraphs 1472-1474). In practice they were sky blue in color. The reason for this was that regulations were written by the Adjutant General and clothing supplied by the Quartermaster General. Under the structure of the Army of 1861 both answered directly to the Secretary of War and the result was often a failure of coordination. Sky blue cloth was much less expensive than dark blue and the cost of equipping the growing wartime Army with dark blue trousers was deemed prohibitive. Officers were required to purchase their own uniforms and enlisted men were issued uniform items by the Quartermaster. The Quartermaster required that enlisted men's clothing and insignia conform to these regulations and by and large they did. Officers had a little more discretion, but the military tailors and military outfitters, who supplied the uniform items were well aware of the requirements of the regulations. Period photographs reveal that perhaps headwear was the most common item to depart from regulation. Certain commonly used items are not mentioned in the regulations. For example, although officer's swords are covered enlisted men's swords go unmentioned. The sword belt plate is described in detail but the familiar U.S. oval plate is not. The omitted items of dress are those of enlisted men and were issued. Those things which were privately purchased or whose mode of wearing needed to be described were more likely to be mentioned in the regulations. Corps badges were first used in 1862 and do not appear in the regulations. They were adopted by General Orders issued by their respective commands. Zouave units also existed outside of the regulations. 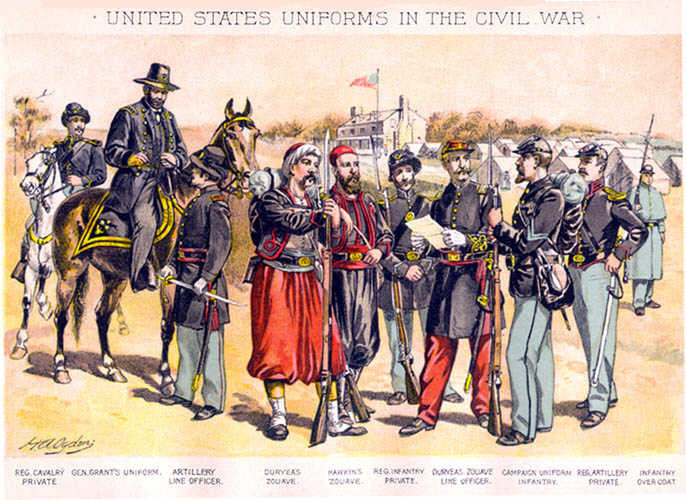 Since these were volunteer units, not regulars and since their special uniforms contributed to morale and enlistments, the regular establishment tolerated the needs of the Zouaves. The text of the regulations are as they appear in a version originally printed in 1862. During the war years a series of additional General Orders modified these regulations slightly. The illustrations used in this Website are not part of the regulations. They have been borrowed, for the most part, from catalogs, including that of Schuyler, Hartley and Graham (1864) and Bannerman (1923). Bannerman disposed of Civil War surplus items. Color uniform images are from the Altas to the Official Records. The enlisted men are posed the same as the well-known official Quartermaster photographs in these. I also show a number of period artifacts and photographs that were either collected by myself or are on loan to this site by their owners. I have a separate discussions of the background history of the American uniform and of the organization of the volunteer force of the Union Army. For those interested in additional information, I would recommend the following books.